This interesting and historic car recently reappeared after being lost for decades. The Binney car has been discussed at length on this website. #85 is the award winning MG Special of Michael Jacobsen. "The MG next to the Binney Doretti is an MG Magnette from the '30s. I know little about these cars but this one was raced in the '50s by a guy named Jacobsen. It ran all of the Cal Club tracks including Paramount Ranch. His son, a recently retired Cal Poly professor, still vintage races his dad's car. He is a member of the Fab 50's. I have talked to him several times. I will try to get you more info." 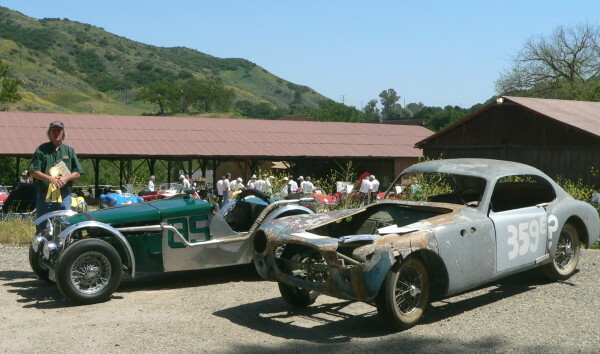 "It was a kick to see Bill Binney's Coupe -- even in that sad condition after all these years. The last time I saw it must have been about 1964 or 1965 -- a Monterey Park postman owned it at that time and it was painted white. (Bill originally painted it red)." From Bill Oker: The Binney-Allied-Doretti at the Concours held at the Biltmore Hotel in Santa Barbara in 1956. Back to: Mercedes-Benz 300SL "Gullwing Coupe"